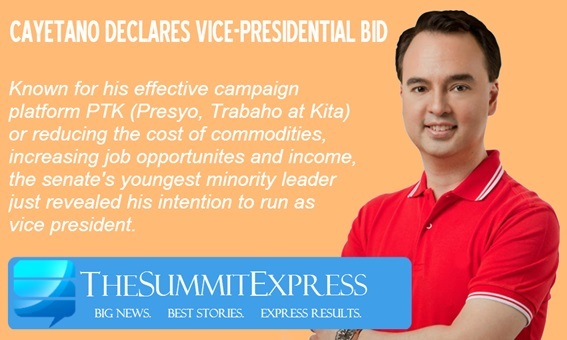 MANILA, Philippines - After giving up on his presidential ambition, Senator Alan Peter Cayetano has just publicly announced his plans in vying for vice president position in the May 2016 national elections. Cayetano, the Senate Majority Floor Leader of the 16th Congress made the declaration earlier today, September 29, 2015 in a press conference in Davao City. Aside from his declaration, Cayetano didn’t disclose any further details of his plan for 2016. Earlier reports says that his name is on the list of Liberal Party’s standard bearer Manuel ‘Mar’ Roxas as his potential running mate. However, Roxas seems to be more pursuant to coalesce with Congresswoman Leni Robredo of Camarines Sur. Cayetano is strongly affiliated with the Nacionalista (NP) Party of which is currently under the leadership of businessman and former senator Manuel ‘Manny’ Villar. But aside from him, another member, Senator Antonio Trillanes III has professed to media his openness to run as vice president. Senator Ferdinand ‘Bongbong’ Marcos who has an alliance with the NP since running under its senatorial slate last 2009 is yet to declare his political plans although speculations are roaming around that he is also taking his political career a step higher with some proposing a ‘Binay-Marcos’, ‘Marcos-Duterte’ and ‘Duterte-Marcos’ tandem. 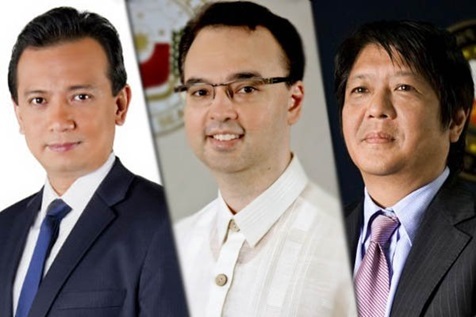 Should the three senators Cayetano, Trillanes and Marcos both decides to run against each other, the NP may find itself in a dilemma on who they will support although recent statement from the party stated that should any of the three senators will seek higher office, NP might have a ‘free-zone’ according to Senator Cynthia Villar, in which their party members are free to choose their bet among the three. This decision might also affect NP’s existing alliance with Team PNoy, a coalition formed last 2013 senatorial elections in which Nacionalista Party is still in alliance with the ruling Liberal Party together with the Nationalist People’s Coalition (NPC), Laban ng Demokratikong Pilipino (LDP), Akbayan Citizen’s Action Party and the National Unity Party (NUP). According to the latest survey conducted by BusinessWorld-Social Weather Station last September 25, 2015, Cayetano ranks 4th together with Senator Loren Legarda as the preferred vice president of the respondents with 5% mark. The survey was topped by Escudero (20%), followed by Duterte (9%), Estrada and Marcos (7%).